MongoDB CRUD Tutorial With Example From Scratch is the today’s main topic. CRUD operations refer to the primary Insert(Create), Read, Update and Delete(Destroy) operations. NoSQL Database, as many of you may already know, is a database used to manage huge sets of unstructured data where the data is not stored in tabular relations like relational databases. There are the following NoSQL database datatypes. MongoDB is a NoSQL database which stores the data in the form of key-value pairs. It is an Open Source, Document-Oriented, Scalable Database. In MongoDB Overall structure, At the upper level, there is database name, then different Collections and then finally Documents. So if we compare it to the MySQL then database name is same for both, then one step down the level in MySQL, there is the table, wherein NoSQL MongoDB it is Collections. 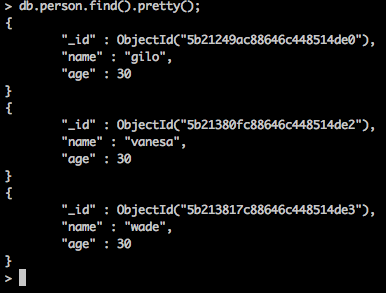 Finally, In MySQL there are Columns, and in MongoDB, there are Documents. If you have installed MongoDB database on Mac previously, then skip this step. For new beginners, go to your terminal and hit the following command to install homebrew. If you have installed, then do not type this command. Now, install MongoDB using Homebrew. After downloading Mongo, you need to create the “db” directory. The db folder is where all the Mongo data files will live. You can create the folder in the default location by running mkdir -p /data/db. Please make sure that the /data/db directory has the all correct permissions. If not, then please give the permission by the running the following command. Run the Mongo daemon, in one of your terminal windows run mongod. It should start the Mongo server at port number 27017. Now, your MongoDB server is running and ready to connect to any client. You need to open this terminal and do not close the terminal. Otherwise, the connection between a web application or client and database will be lost. Now, if we want to see how many databases are there by default, then we can use the following command. Now, we will create a database and perform a crud operation on that. Now, we can create one database using the following command. It will switch to the demo database, and if the database is not there, then it will create for you. If you want to check your currently selected database, use the following command. The cool thing about MongoDB is that you need not create a collection before you insert the document into it. With a single command, you can add a document in the collection, and the MongoDB establishes that collection on the fly. Now, you will see something like this. It will create a collection called a person and add one document in it. The Batch Insert is an operation that allows storing of multiple documents in a database at a time. You can send the hundreds or thousands of documents in a batch at a time. This feature makes the whole insert operation faster than regular insertions as multiple documents or records can be inserted simultaneously. In the ordered operations list, MongoDB database performs the write operations in the list serially. If at any particular point of time, any error occurs during one of the write operations, MongoDB returns without executing the remaining write operations in the list. It will not continue from that. In an unordered operations list, MongoDB database can perform the write operations in parallel in a random order. If at any point of time, an error occurs during the write operation, MongoDB will perform remaining write operations uninterrupted. When performing an unordered list of operations, MongoDB groups them. You can see the created document using the following command. 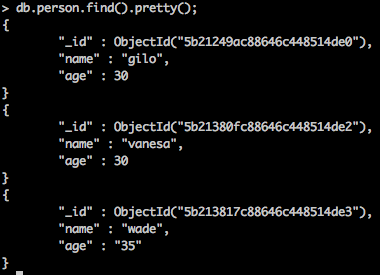 I have used pretty() to look results decidedly more excellent. You can observe that the record retrieved contains an attribute called _id with some unique identifier value called ObjectId. It acts as a document identifier. Okay, now add two more documents and Read that documents. Now, if you want to update any collection, then you should specify the criteria on which you need to update the particular document. You can write the update query like this. So, we have updated age, whose name is wade. We can see the changes using the following command. We can delete the collection based on the provided criteria. We can drop the database using the following command. 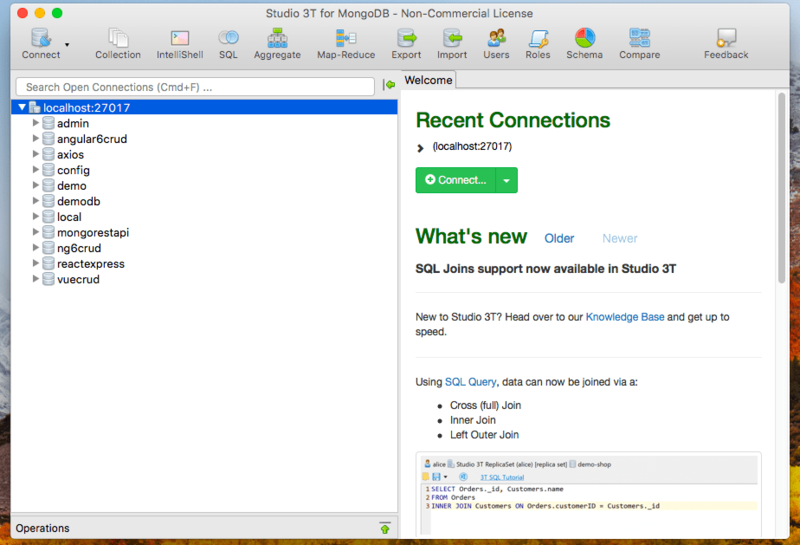 If you do not like the Command Line Interface, then you can also use Studio3T for the GUI based MongoDB implementation. It is very helpful. If you want to do some practice using MongoDB, then you can do it here. At last, MongoDB CRUD Tutorial With Example From Scratch is over.